Cricket - Warley v Booth. Warley bowler Luke Duckitt. Booth’s quest for a third successive title in the Spenser Wilson Halifax League got off to a disastrous start yesterday when they were the only team in the Premier Division not to pick up a point. They were bowled out for 97 at Warley with opening bowlers Amjid Azam and Luke Duckitt taking four wickets each. Only four players made double figures for the visitors - experienced Ian Sharkey (28), last season’s 1,000-run man Rob Laycock (16), No 10 Moazzam Ayub (18) and captain for the day Patrick Thomas (10). Nolan Bottomley (27 no) anchored the home reply and Shazad Hasson hit six fours and two sixes in a knock of 41 before being bowled by Ayub with his side on the brink of a victory achieved by an eight-wicket margin. While a pitch which had been very wet at the start of the week was clearly a factor in Booth’s low score, the league decision to go ahead with the opening programme was vindicated. Only three first team matches out of 15 failed to start with the grounds at Mytholmroyd (v Copley), Low Moor HT (v Greetland) and Upper Hopton (v Leymoor) proving too wet, despite the superb drying weather of the last seven days. Oxenhope and Triangle matched Warley in picking up the maximum 12 points in the top flight. More than 500 runs were scored at the admittedly small Bridgeholme ground as Oxenhope beat their promoted hosts by 17 runs. Richard Ellis and Joel Fotheringill took nine wickets between them as the visitors defended a total of 266, Nazakat Ali (56), Zaheer Abbas (53) and Ikram Mahmood (46) leading the home reply to Oxenhope’s 266 all out. Triangle successfully defended a score of 110 at Sowerby St Peter’s with 31 from new signing Chris Metcalf and 22 from No 10 Liam Turner eventually proving vital. Experienced Martin Schofield took six wickets for the hosts, a return matched by paceman Kurtis Whippey who is normally more suited to fast, bouncy pitches. Sowerby were all out for 94 after being 38 for five. The newly named Shelf Northowram HT got off to a winning start with a seven-wicket victory at promoted Southowram, in spite of an unbeaten 82 from the hosts’ long-serving Dean Crossley. Southowram made 163 for six but the visitors eased to victory thanks mainly to third-wicket pair Razwan Saghir (59) and Oliver Hemingway (47 no). Last year’s third-placed finishers Thornton were six wicket winners at SBCI. Illingworth St Mary’s were runaway winners of Division Two last season, following their return from the Aire/Wharfe League, and they demonstrated their intent to be playing Premier cricket next season with a crushing 216 run defeat of Stones. They powered to 286 for three with 100 from Dan Murfet and good knocks from the Cooks, Callum (77) and Steve (53 no). The St Mary’s club needed only three bowlers to complete the task at Ripponden with Jamie Moorhouse and Luke Brooksby taking three wickets each and first change Ben Clarke four as Stones were rolled over for 70. Sowerby Bridge had a comfortable 79-run win at Great Horton PC after posting 200 for six. There was a remarkable finish at Clayton where visitors Blackley were just one decent hit from victory at 89 for four chasing 95 for victory. Instead the loss of opener Freddie Fox for 41 prompted a dramatic collapse to 90 all out with Paul Gelder and Joe Selby adding three wickets to the three taken earlier by star returnee Sam Wilson. Simon Collins, like Wilson a former Jer Lane player, also took three wickets as promoted Bradshaw had a 61-run win at neighbours Queensbury. Ex-Bridgeholme player Oliver Challis hit 42 and took a couple of wickets for Queensbury but Bradshaw’s total of 194 proved out of their reach. Bradley & Colnebridge made a winning league debut in first XI cricket with a four-wicket home win over Mount in Division Two. The other two games to go ahead in the bottom section produced wins for Calder Valley pair Old Town and Luddenden Foot. After a troubled winter there were no immediate signs of things getting better for Cullingworth, who were bowled out for 59 in reply to their visitors’ 145. Ryan Allen started his campaign with bowling figures of 7-5-2-5 for Foot as hosts Outlane mustered only 87, opener Adam Davies getting 37 of them. The visitors needed only 11 overs to complete an eight-wicket win with Lee Broadbent typically crashing six sixes in his 47 and Hayden Bruce undefeated on 34. RESULTS - Premier Division: Oxenhope 266, *Bridgeholme 249: pts 12-6. *Mytholmroyd v Copley – no play: pts 2-2. *Southowram 168-7, Shelf Northowram HT 169-3: pts 2-10. *SBCI 152-9, Thornton 153-4: pts 3-10. Triangle 110 *Sowerby St Peter’s 94: pts 3-12. Booth 93,*Warley 97-3: pts 0-12. First Division: *Clayton 94, Blackley 90: pts 12-0. Sowerby Bridge 200-6, *Great Horton PC 121- 5: pts 10-2. *Illingworth St Mary’s 286-4, Stones 70: pts 12-1. Bradshaw 194-5, *Queensbury 134: pts 12 -2. Second Division: Mount 123, *Bradley & Colnebridge 126-6: pts 2-12. Old Town 145, *Cullingworth 59: pts 12-3. 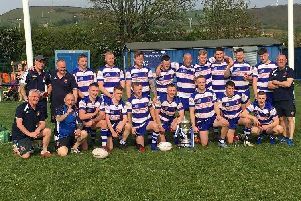 *Low Moor HT v Greetland – no play: pts 2-2. *Outlane 87, Luddenden Foot 88-2: pts 0-12 *Upper Hopton v Leymoor – no play: pts 2-2.